For severe osteoarthritis sufferers that have been unresponsive to medication, joint replacement surgery is a common solution. Knee and hip arthroplasty involves removing any damaged surfaces of the joint and replacing all or part of it with a prosthesis. With Australia's population aging, there is an increased demand for these types of surgeries. 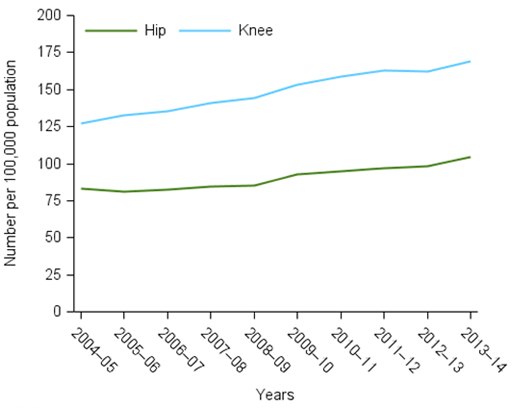 Over the past 10 years, hip and knee replacements have significantly increased annually. Rehabilitation is a vital stage for patients undergoing hip or knee arthroplasty. Rehabilitation aims to improve patient quality of life, maintain pain free function of the joint and build strength in the muscles surrounding the new joint. It is also crucial to help with circulation to prevent blood clots. With funding from Medibank, Janine Loader from St Vincent’s Hospital aims to look at reduction in variation of referral practices for rehabilitation for patients who have hip and knee arthroplasty. This will improve health outcomes of patients with reduced length of stay in hospital and potential improvements to health related quality of life. Findings can facilitate the subsequent development of a perioperative rehabilitation protocol for total hip or knee arthroplasty targeting patients with individualised models of rehabilitation (e.g. inpatient, outpatient, home-based) further supporting efficient, cost effective and person centred rehabilitation care management for Australians.